3-D collaborative environments are no longer far out. One look at that PowerPoint slide tells you the flatland model is broken. It served its purpose, and it's time to move on. The world has changed. 3-D is an answer when it comes to collaborative communication and decision-making. Virtual business environments like ProtoSphere, with features such as data visualization, war rooms, and interactive surfaces that support multi-channel app and data shares, are exponentially better suited for communicating, collaborating on, and managing complex information. Frankly, we're at the beginning of the future. In addition to representing the information better, 3-D environments let you socialize the information. For instance, in ProtoSphere, your avatar carries a tag cloud of relevant information. It's connected to your user profile, your business blog, and your business wiki, as well as team blogs and wikis that are part of your collaborative knowledge network. The result is it's easier to extract knowledge from complex topics and make it shareable and actionable by a team. This leads to faster collaborative decision-making and a higher performing workplace. By bringing core data sets and users' own knowledge to the fore, you gain a rich information set from which to make decisions. 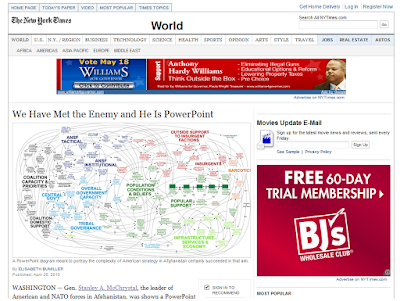 So recent headlines about the military's overwhelming PowerPoint slide confirm for me that our belief in 3-D Web-based collaboration is spot on. The world is shrinking, information is getting more complex, and we must escape from flatland to be effective in the future. The coup has been staged! Do you have a better way to represent this information in 3d? I'd like to see an example. Great question. Take a look at the post just published from Sam Batterman at Microsoft: http://blog.protonmedia.com/2010/04/art-of-being-simplistic-and-science-of.html. I believe it answers your question. Ron, thank you for the link. I loved how the realistic rendering of clouds turned into the mathematical model of the main flows! However, that's not a 3d tool for representing incredibly complex concept maps or flow charts, which is the type of data in the military example here. My question is quite particular. Do you know of any ways 3d tools can help us to visualize complex concept maps better? I could probably clean up the concept map here by chunking/grouping, using levels, color-coding and size-coding the contents. All these are 2d tools. I don't know of any 3d tools that would help with this particular data type. I'd like to learn of them, though. Maria - In studying the chart I've noticed a few things...one, almost all the arrows are uni-directional, which means this is a directed graph - possibly a flow - what is happening in parallel and what happens serially? Very hard to distinguish from this visual. Another thing - what's most important on this chart - everything seems to have the same weighting - the same size line and the same opacity. So, what I'm saying here is that not only is the visual confusing - it's totally the wrong visual in the first place. I'd like to see this animated and perhaps even overlaid on geography - what tribal issues are impacted by the governments actions? When? Where? Map overlays would be great.